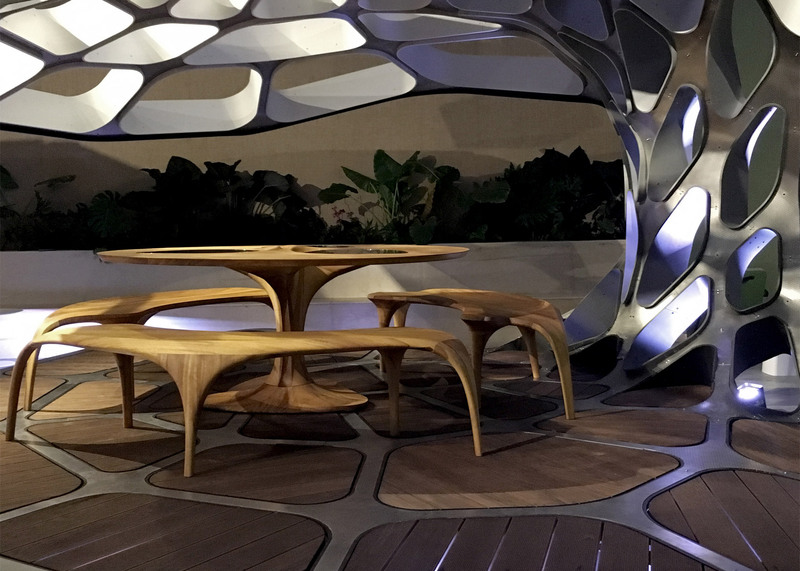 Design Miami 2015: architects Zaha Hadid and Patrik Schumacher have designed a dining pavilion shaped like an open clam shell. The project has already seen temporary spaces designed by names including Ron Arad, Kengo Kuma and Sou Fujimoto. Volu is installed inside the collector's lounge at this year's Design Miami fair, which is taking place from 2 to 6 December 2015. A sculptural table by Janne Kyttanen and loopy chairs by Aranda\Lasch are also on show at the event. Hadid currently has a high-rise residential tower under construction in Miami, and was chosen by the City of Miami Beach to design a parking garage at Collins Park in 2011.